What is 100% Kona Coffee? Aloha! Whether you are a local, a frequent visitor to the Island, or maybe you were here once for that special vacation, there is a mystique that follows the 100% Kona brand. If you have ever wondered ‘Just what is 100% Kona?’ and ‘Why does it taste so good?’, let us be your guide and we’ll walk you through the basic principles of what makes 100% Kona so special. Is it a plant, a bush, a tree? Coffee belongs to the Rubiaceae family, a flowering shrub whose fruits (coffee cherry) contain seeds that are processed into what we know as coffee. Coffee was introduced on Hawaii in the early 1800’s. Since that time many coffees varietals have been introduced to the region. The dominant varietal however remains “Kona Typica”. Introduced to the Island in late 1800, Kona Typica originating in Guatemala, proved to thrive under the growing conditions in Kona. Kona Typica is a member of the coffea arabica family distinguished generally from its close relation the coffea rusika as a higher quality though more difficult to cultivate varietal. Kona Typica is known and sought after due to its low-acidity and smooth, heavy body. The trees are generally trimmed short (10’-12’) to aid in the Hand-Picking process. The cherries, which contain the coffee bean as two seeds inside, ripen at different rates on the same tree and must be hand-picked to ensure only the ripe red cherries are picked. Let's look at the geographically-set parameters to 100% Kona Coffee. To call yourself 100% Kona you must grow your coffee within the Kona Coffee Growing Region also known as the Kona Coffee Belt. The Kona growing region is about 2 miles long and ranges in altitude from 600 ft. to 2500 ft. Kona has approximately 600 small farms. Most of these farms are small, so-called micro lots of 1-5 acres, whereas some farms are upward of 100-400 acres. Only coffees grown in Kona may use the 100% Kona label. Coffee can only be grown on a commercial scale in a limited area around the globe. For coffee to grow and prosper essential factors must be met. Elevation is important for coffee and in Kona the high elevation serves two major functions when it comes to growing quality coffee, temperature, and precipitation. Kona Coffee grows high on the hills of Hualalai and Mauna Loa. The high elevations are consistently cooler than the coastal area. The cooler temperatures allow the beans to mature slowly. This results in a denser, more complex bean. Coffee needs ample fresh water to grow into a quality product. The high hills in the Kona region receive an average of 60 inches annually. Whereas the coastal regions are rarely besought with rain, it rains quite often up on the hill. The same clouds that bring the rain also bring the next essential ingredient for quality coffee, shade. Shade keeps the trees cool and slows the dissipation of moisture and protects the trees from excessive sun. Again, the slower the cherries develop, the denser the bean and the denser the bean the more flavor a quality roaster can extract from it. Aside from temperature and elevation coffee needs the proper slope to thrive. All the rain in the world won't help make quality coffee if the area you are growing in it does not have an ideal slope. Slope is the gradient, grade, or incline of the hill on which the coffee is grown. Without the proper slope essential rainfall would either puddle up and risk root rot, or flow by too quickly for the trees to absorb. Most notable to quality within the Kona growing region is the volcanic soil (Terra) in which the coffee is grown. The Island of Hawaii, in geological context, is a very young Island. The volcanic soil is still loaded with nutrients that the plants need to grow and flourish. The soil is also quick to absorb moisture, yet not too dense as to suffocate the root structure. To put things into perspective the total production of the Kona Coffee Region is about 2 million pounds and the total acreage farmed is about 2700 or 27 hectares. Brazil, the largest coffee growing country, has over 2 million hectares of farmland devoted to coffee with a total yearly yield of about 2 million tonnes or 4.5 billion pounds. The largest farm in Kona is basically a micro lot in Brazil by these standards. Being small in scale and primarily family run allows the growers in the Kona region to be selective, precise and to have a control of quality that is often lost in the larger coffee growing regions of the world. In Kona, the pride of production is palpable anytime you meet growers, producers and others involved in the process. Having a smaller farm also allows the local farmers to quickly adapt, make changes and experiment throughout the production process. Ideal growing conditions are essential in producing a great cup of coffee, but what puts Kona on the top of that list is Aloha. There are a handful of factors that distinguish a great growing region from an otherwise good growing region. Colombian coffees stand out for their high elevation, African coffees for their terra, or soil, and so many central and South American coffees for their select varieties such as Geisha in Panama. One factor among the many is not going to make a great cup of coffee, it takes a combination of ideal environmental conditions, care, pride, and knowledge to make a cup distinctly excellent. 100% Kona Coffee is grown in a small, highly regulated region high in the Hawaiian hills of Kona. 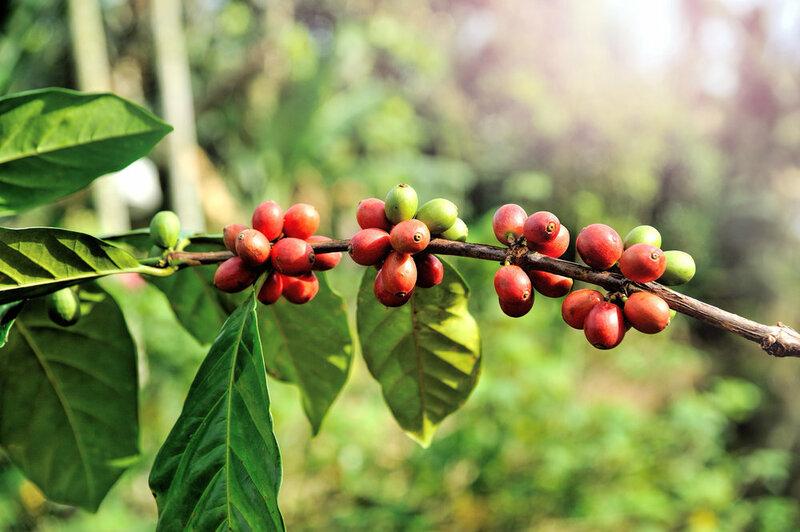 The hills receive optimal sun, rain, and nutrients, but above all else, Kona farmers are excited and passionate about the coffee they grow and truly encompass the full spectrum of Aloha in that passion and you can taste it. All the right ingredients from nature and environment coupled with island Aloha make Kona Coffee much more than a simple tasty vacation treat. 100% Kona is verifiably a top shelf choice in the specialty coffee arena.